Somewhere along the line, I became someone who loved the images taken of people’s studios, a table full of pots, waiting to be glazed, a pile of pots thrown into reclaim, slowly melting into mud. A shelf of bisqued pots, stacked according to the potter’s personality, a promise of a future. A lying in wait. Maybe others feel this way about their vocations, maybe those who identify as writers feel this way about paper, about pens, about typewriters, or contemporary versions–iPad keyboards, or laptops. I wouldn’t know. A ceramic studio sends me. It could be anything typically found there– a bucket full of dirty tools, a wheel caked in muck, a group of wedged balls ready to be thrown. If I enter such a space, I breathe differently, feel hopeful. The glance around my studio or someone else yields too many images to count, and layers of experiences mingle. I learned to throw in a noisy shared studio. My first year of studio memories includes one a teacher offering a demo on how to throw a tea pot, how to finish it in one evening. 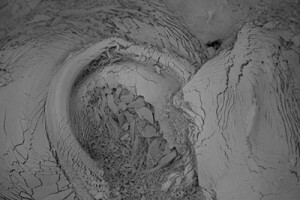 After he had shown how to throw the parts, he placed a tall pile of clay down in front of the wheel, high enough for a hair dryer, pushed the hair dryer into the clay so that the nozzle was directed towards the pot, turned the wheel on to a slow rotation, flipped the switch on the hair dryer, and left for twenty minutes while the air slowly (or quickly) dried the pot enough for him to attach a spout, a handle, a lid. Take that noise of a hair dryer and add to it the sounds of ten people throwing on wheels, the sound of starting and stopping, the snippets of conversations, the laughter. Working in the quiet of my own studio now, I sometimes want to sign up for a weekly class, if only to encounter a collective rumble. 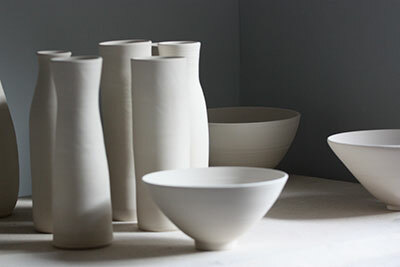 I’m not much for thoughts on process, might roll me eyes if someone suggests some sort of zen and centering opportunity in spinning a lump of clay, but if no one’s listening (or in this case reading), I will admit to a love of this process. I love it from start to finish, from the first steps of making clay–heaving fifty pound bags of materials off of shelves, throwing them on a cart, moving that cart towards a industrial clay mixer, pulling on a mask, slowly making the right adjustments for a feasible clay. When the clay has settled into itself, when it’s ready to throw, if I pull out a chunk, throw it on to a wedging table, feel the clay, its elasticity, and decide on its future, no part of me can hide my enjoyment. I sometimes close my eyes and listen to the sounds of clay, listen as my chunk of clay hits the wedging table, as I start in on moving that round of clay, it sounds a sweet rhythm. 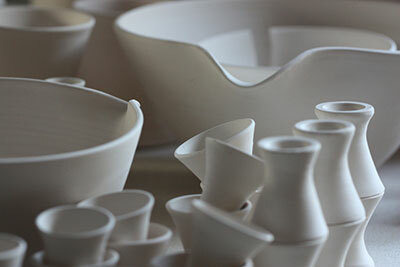 Working with clay seduces, even the funky smell of some reclaimed clays. And the images of a glaze room, or shelves on shelves of pottery fired once, waiting for glazes, or forms slowly drying under plastic, hanging from shelves in the silence after everyone leaves. Heaven.